Our friends are our friends because we like being around each other. And we want people that like being around each other when we throw a party. And most times, that’s perfectly fine and all we need to have a wonderful event. But next time you’re working on a guest list for a dinner party, and want to switch things up a bit, consider inviting a table-full of people who don’t know each other very well (or at all). Everyone will have the common ground that they know you, so no need to worry about anyone feeling left out. And it’s a wonderful thing to see, after sharing a lovely meal together, a group of newly-connected folks continuing to chat with each other as the hours get wee and the wine levels get low. 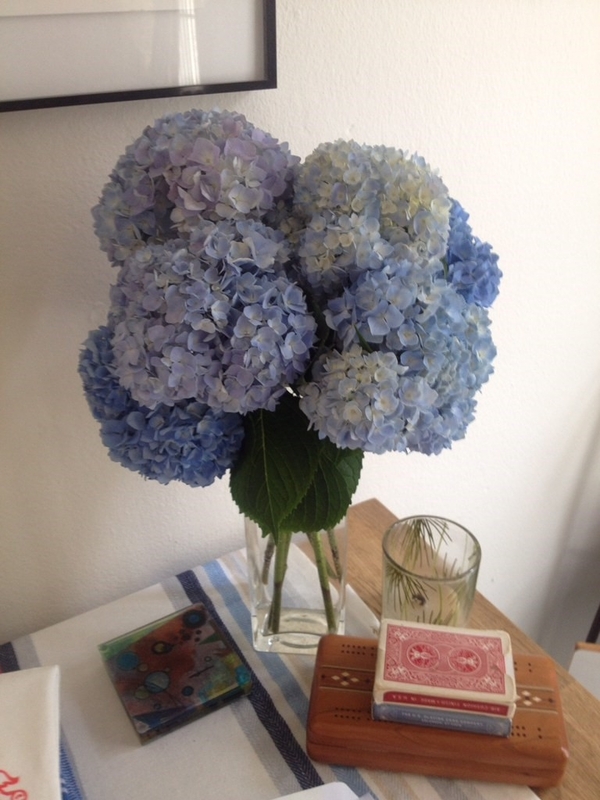 When I first started arranging flowers, I was terrified to buy hydrangeas! With such beautiful and showy large blooms, they are not cheap, ahem . . . ‘inexpensive.’ Plus they do require a little special care to prolong their vase life. I learned a few tricks and now I use hydrangeas frequently, especially in arrangements where I’m after a bit of volume. I also love their cloud-like forms when used in massed arrangements on their own. It’s important to remember when preparing these beauties that the root of the word ‘hydrangea’ comes from the Greek word for ‘water.’ Before I cut and arrange, I often submerge the entire bloom and stem in water to hydrate the flower. Cut the stem under water at a sharp angle and place in water with floral preservative and allow the flower to drink for several hours. If the stem is very hardy, I’ll smash the cut end and plunge the stem into an inch of hot water for a few minutes at this stage as well. These few steps usually do the trick and prolong the vase life for several days. And get this - if the hydrangea wilts, you can repeat: recut, replunge and revive the bloom! Eek! Zombies! They’re coming to get you, Barbara! These are the actual resurrected blooms! They looked like deflated balloons before I recut them. 1. Make Pigs in a Blanket - use crescent rolls, they are so easy, and people LOVE them! 2. Order Egg Rolls from your favorite Chinese Takeout - cut in half. 3. Order Crab Rangoon from same - get two orders - these are SUCH a treat. 4. Order 2 of Steak, Chicken and Cheese Quesadillas from your favorite Mexican place...cut them in quarters and serve with quac (I usually order that too). 5. Purchase three big-ish chunks of cheese...a soft, a hard and something BLUE or STINKY. Let people break off hunks. Crackers and some grapes help round it out. Maybe some honey. 6. Make a party punch (example: 1 bottle of good vodka, a case of decent beer, light in color PLUS 6 limes, sliced, AND lemonade to taste and PLENTY of ice - makes one big PARTY shandy). 7. Ask people to bring WINE. 8. Two Bite Brownies or Cookies from Whole Foods (or your local bakery) round out the evening. This should give you enough time to put on music (vinyl anyone?) and change before the first guest appears! Don’t let the machines dictate your party vibe! Seriously, streaming music services are pretty much fine for doing the dishes or sorting laundry, but anyone who has relied on them for music at more than one party can vouch for their limitations. Instead, consider picking the music to play at your next party or group dinner. Show off your vinyl, if you have some. Dig into those old CDs. Take a few minutes to pull together a playlist from your iTunes. You’ll be surprised at what a conversation starter it can be. (We’ve seen two closet Hall & Oates fans discover each other when “She’s Gone” played.) And don’t worry about programming music that you think your guests will want to hear. Go for what YOU like, and what YOU want the party vibe to be. (But roll out the bossa nova for your next warm-weather, candlelit, outdoor dinner -- perfect!) Best part about shutting off the streaming….no commercials. Sometimes, it’s not enough to just look good . . . I often want to smell good too. So, maybe the hyacinth is my spirit flower? Is that a thing? I really love the heady fragrance that these flowers produce as they open. One of the most recognizable of spring bulb flowers, a simple bowlful of five or six blooms makes a big impact and can easily perfume an entire room. Hyacinths come in an amazing array of colors too - from soft white to pale pastels to saturated blues and purples. Perfectly suited to placement in entryways and powder rooms, be careful using them in a restaurant setting, where their powerful scent might interfere with other olfactory (i.e. smelly) experiences. Take care when conditioning, handling and arranging hyacinths too, as they are toxic to other flowers and can cause mild skin irritation. If you cut the stem, leave the flowers to condition in water overnight before mixing them into arrangements with other spring flowers (same for daffodils!) Really, you need only rinse the dirt off the stem and bulb and leave the hyacinths to stand in water for a few hours before arranging - the flower will last longer without cutting. Welcome to the Cherry Hill Events Blog! I recently read Peg Bracken's I Hate To Cook Cookbook (as well as the appendix), published in 1958, and I was amazed at many of the hints and tips that came from her kitchen over 50 years ago. However, the one big AHA moment for me, was in her section on "Dinner Parties". Obviously, when you hate to cook and must throw a dinner party (because your husband's bosses are coming to dinner, Betty Draper) you doubly-hate to make dessert. Have no fear as Peg recommended the perfect thing - a simple Irish Coffee. I was amazed at how, well, correct she was...the Irish Coffee hits all the perfect notes at the end of a meal - sweet, coffee, and whiskey! What more do you need? She recommended serving the coffee, and if you feel like it, chocolates or pre-made cookies to round it out - I would suggest shortbread! Fill a mug with hot water to preheat it, then empty. Pour piping hot coffee into warmed glass until it is about 3/4 full. Add the brown sugar and stir until completely dissolved. Blend in Irish whiskey. Top with a collar of the whipped heavy cream by pouring gently over back of spoon. Serve hot. PS: if you find yourself in San Francisco, make sure to hit the Buena Vista Cafe in Fisherman's Wharf for the best Irish Coffee I've ever had. It should look just like this!!!!!!!!! !